Megan has embarked on an exciting new adventure this school year. 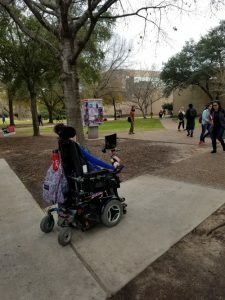 She is living on campus at University of Houston and overcoming obstacles unique to most freshmen. Megan has cerebral palsy. Prior to starting at the University of Houston Megan relied on caregivers to provide transportation to and from school. Determined and independently-minded, Megan has successfully learned to navigate campus without help. With a little help from the Google Maps app (walking version), Megan is able to navigate herself around campus. 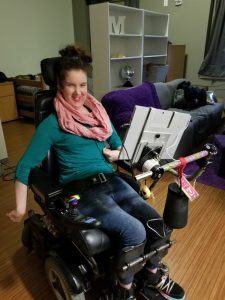 Other apps Megan has found useful during her transition to college and allows her to be independent are Skype, GroupMe, Roku, and Instacart. And, BridgingApps has created a helpful list of Apps for Transition here. Megan also uses Tobii Eyegaze. Eye tracking is a technology that puts users in control of their device by using their eyes as to interact with a computer. A computer equipped with an eye tracker “knows” what a user is looking at, kind of like using one’s eyes as a wireless mouse to select items on a screen. This makes it possible for users to interact with computers using their eyes. Megan recently shared her experience using Tobii and a Bose Speaker for communication. Can you hear me? Adding a speaker to my device gets me… in the conversation! 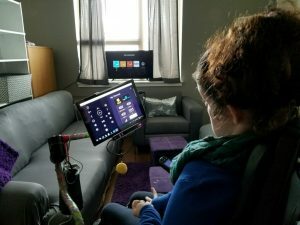 Integrating my Tobii Eyegaze device into my world so that I could project my own thoughts was a long process, but so empowering for me. I have the complete support of my family, my friends, teachers, and anybody who I want to speak to. They already knew how to stop and wait for my response. However, an additional challenge was being in conversation with multiple people at once. Not only does it take me a little while to formulate what I want to say before I can say it, often times there are people already speaking and they don’t hear what I have to say, even at the device’s highest volume level. Or more often, they don’t feel comfortable with silence and just simply move on with the conversation. I don’t want to stop conversation just so people can stop and listen to me. and I don’t want them to feel bad. I want to integrate myself into their world instead of them into mine. It is an important step for me to become more into everyone else’s daily life. An issue I was having with Tobii was that the volume was never strong enough. So, I needed to think outside the box. I thought it was an easy enough solution to just buy a bluetooth speaker that could amplify sound from my device. I started with a very small expensive speaker that really did get the volume up, however in trying to save battery, the manufacturer would make it turn off if you did not use it after 10 minutes. That’s a great idea for most uses of a bluetooth speaker, however I’m not talking constantly. So it would automatically turn off and I did not have the ability to turn it back on myself. Someone else would have to do it for me… which slowed down conversation. After a few different trials, I found Bose SoundLink Revolve+ Portable & Long-Lasting Bluetooth 360 Speaker that, can be set to ‘never turn off’. Now, I even scare myself when I speak…lol. People can definitely hear me and it works great in noisy places too, restaurants or outside. And, I am really enjoying group conversations. Some of the negatives to the speaker are that it is big. I currently have it hanging on my device mount because putting in my backpack muffles the sound. Also, someone else must download the “settings app” on a cell phone that allows the user to set the speaker to not automatically turn off. But, once it is set, you don’t have to do it any more. Another con to the Bose SoundLink is that it is expensive at nearly $300. Megan, This is fantastic stuff. So happy you are enjoying college. You were most definitely born st the right time! When I was in college I did not even have a cell phone and typed all my papers on a manual typewriter!